General purpose clip slings for single or double amputees. ArjoHuntleigh Amputee Slings are designed to fulfill the special support and comfort requirements of single and double amputees. General purpose clip slings provide good comfort and support for a range of everyday patient handling routines such as bed and chair-related transfers. Clip slings are used in combination with the 4-point DPS (Dynamic Positioning System) spreader bars which offer a more comfortable reclined position in the sling and a more even distribution of the patients weight. 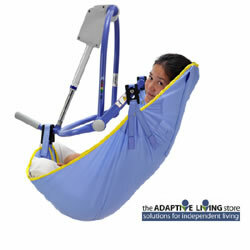 The Double Amputee Sling is suitable for residents/patients with bilateral leg amputations above knee or total hip. The Right Leg Single Amputee Sling is for residents/patients with right leg amputations above or below knee or total hip residents/patients. The sling is shaped to give additional support around the amputation site. The Left Leg Single Amputee Sling is suitable for residents/patients with left leg amputations above or below knee or total hip residents/patients. The sling is shaped to give additional support around the amputation site. Size Guidelines: The 3 basic components for a proper sling fit: patient height, patient waist size, patient thighs size. The patient's physical disabilities, weight distribution and general physique also need to be taken into consideration.